A team of Yamaha motorcycle designers have put their experience to the test in a new field by developing an ultralight airplane that’s powered by a simple set of pedals – just like your bike! Constructed from superlight polystyrene and carbon fiber, the plane weighs only 81 pounds despite a wingspan of 117 feet. 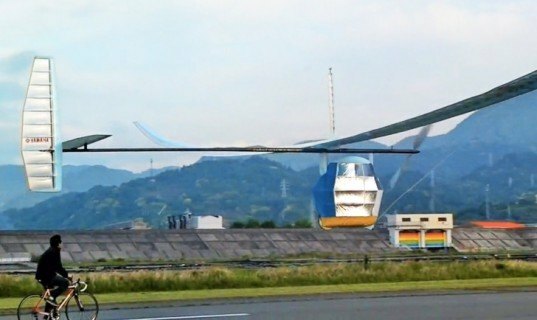 Encouraged by mostly successful test flights, Team Aeroscepsy will attempt to set a new world record by flying Gokurakutombo (which means “happy-go-lucky” – and apparently also “happy dragonfly” in Japanese) 75 miles over the Pacific Ocean. There’s always something unnerving about flying over a large body of water. Even though it’d probably be better to land in water, being far from the familiar sight of solid earth is unsettling at best. But what if the only thing keeping the plane aloft was the energy contained in your very own leg muscles? That adds an entirely new layer of uncertainty. Apparently, this fear is not shared by the designers on Team Aeroscepsy. They plan to use a professional mountain biker (someone used to pedaling long distances) to pilot their plane for its unprecedented journey over the Pacific. They say the experience will be akin to pedaling uphill for the entire 75 miles. Hopefully, the pilot will get some assistance from Mother Nature along the way. The plane’s lightweight construction and vast wingspan mean it can take advantage of thermal air currents to help it stay in flight. But, according to PopSci, that’s a double-edged sword, because even a light ocean breeze can also work against it. 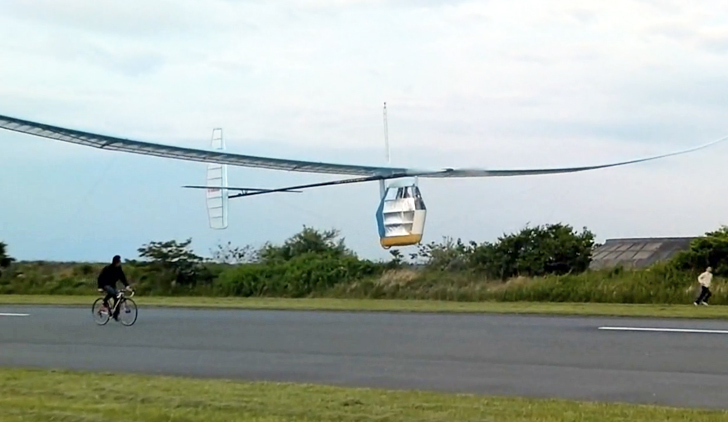 The current world record for human-powered flight was set by MIT in 1988 with the pedal-driven Daedalus, a contraption named after the father of Icarus in Greek mythology. The Daedalus plopped into the Mediterranean just a few meters short of the Greek island of Santorini after flying 115 kilometres from Crete. Let’s hope Gokurakutombo’s flight, planned for Spring 2013, has a happier ending! i would like to construct my own thats why i got to this site now. please help to fulfill my dream in life. A team of Yamaha motorcycle designers have put their experience to the test in a new field by developing an ultralight airplane that's powered by a simple set of pedals - just like your bike! Constructed from superlight polystyrene and carbon fiber, the plane weighs only 81 pounds despite a wingspan of 117 feet. Encouraged by mostly successful test flights, Team Aeroscepsy will attempt to set a new world record by flying Gokurakutombo (which means “happy-go-lucky” - and apparently also “happy dragonfly” in Japanese) 75 miles over the Pacific Ocean.